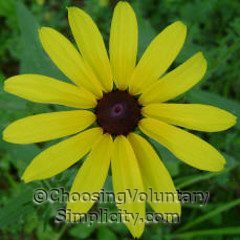 Black-Eyed Susans (Rudbeckia hirta) are probably one of the best known coneflowers because they grow so abundantly in open and sunny areas in almost any kind of soil. They grow quickly and are sometimes called “pioneer plants” because they are some of the first plants to grow in newly-cleared fields or burned-out areas. These plants live for only two years. The first year each plant produces a cluster of leaves close to the ground. 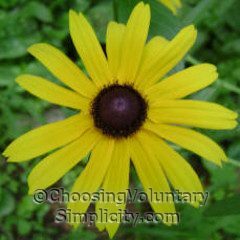 The second year each plant produces flowers on two to three foot high stiff, branching stems. At the end of this second year after the flowers fade, these plants die. 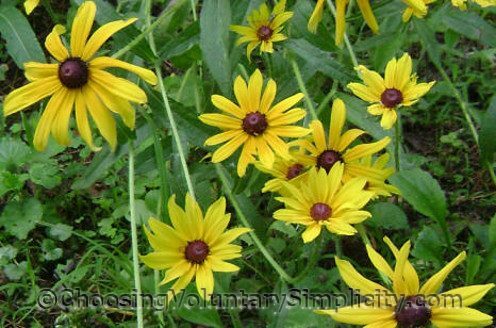 Seeds from the spent flowers germinate in late summer and the young plants live over until the next year to start the cycle all over again. 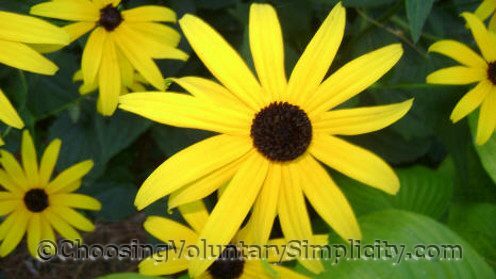 Each flower is two to three inches across with bright yellow petals (called ray florets) and a brownish-purple dome-like center that becomes more conical as the season progresses. Some flowers will have as few as eight petals… other flowers will have as many as twenty-one petals… and the petals will also vary in shape and size. 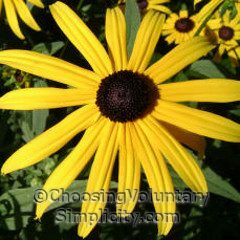 Note: Black-Eyed Susan has been put on the list of plants that may cause skin irritation in some people. 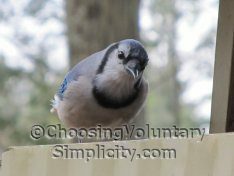 I think you have a nice site. I learned a lot about feverfew, which I have in my yard. I think they’re beautiful too but I have to keep my distance because I’m one of the ones who get a skin irritation if I touch them. That doesn’t stop me from admiring them and having them in my yard though. You have a beautiful site. We have these growing in the empty lot next to our new house. Most of the petals are the thin ones and there are mostly 20 petals. I think it’s interesting that they don’t all look the same. Great photo’s. 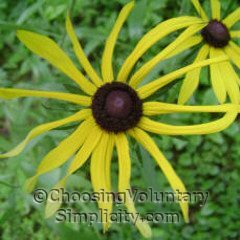 I get a very itchy, red, bumpy rash on my wrists and forearms from touching black eyed susans. They have these tiny spines that prick my skin. I’ve developed a sensitivity to them. It lasts about a week. If I don’t scratch, it fades, but not scratching is very difficult. I am so glad to know that I’m not crazy. After pulling these from my flower bed, I was miserable. It was instant burning and I thought I was being attacked by insects. When I went back out the next day to finish, it was worse. I had the wash off and spray with Benedryl. I’m consumed in tiny bumps of which I had no explanation! Almost had them cleared up and then I cleaned out another bed of Rudbeckia. My downfall, as the bumps/rash came back and I’m broken out all over again. I wear Calamine and Benedryl as my perfume. Very glad to confirm my suspicions and read this website. Thank you All….